How do you cook heartnuts, hawthorn fruits or hostas? What's the best way to preserve autumn olives or to dry chestnuts? Forest gardening - a novel way of growing edible crops in different vertical layers - is attracting increasing interest, for gardens large or small. But when it comes to harvest time, how do you make the most of the produce? l Over 100 recipes for over 50 different species, presented by season, plus raw food options. l Information on the plants' nutritional value, with advice on harvesting and processing. l Chapters on preserving methods, from traditional preserves such as jams to ferments and fruit leathers. 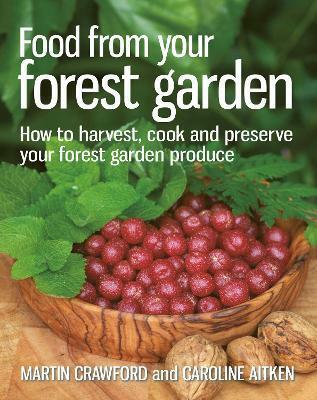 With beautiful colour photographs of plants and recipes, this book is an invaluable resource for making the most of your forest garden - and an inspiration for anyone thinking of growing and using forest garden crops. Martin Crawford, Director of the Agroforestry Research Trust, forest gardener and author of the bestselling Creating a Forest Garden, has teamed up with Caroline Aitken, a permaculture teacher and cook on Patrick Whitefield's permaculture courses. Her passion for cooking and Martin's passion for growing are combined to offer creative and imaginative ways to enjoy the crops from your forest garden. Martin started his working life a computer programmer, but his passion for organic gardening quickly led to a change in career. In 1992 he founded the Agroforestry Research Trust, a non-profit-making charity that researches into temperate agroforestry and all aspects of plant cropping and uses, with a focus on tree, shrub and perennial crops. At his 2-acre forest garden in Dartington, Devon, planted 15 years ago, Martin systematically researches plant interactions and unusual crops. He also runs a commercial tree nursery specialising in unusual trees and shrubs, and has an 8-acre trial site, researching fruit and nut trees. See www.agroforestry.co.uk for more information. Martin teaches courses on Forest Gardening and Growing Nut Crops, writes books and edits a quarterly journal, Agroforestry News. He has published a large number of books on specific areas of forest gardening. His book Creating a Forest Garden - the forest gardening `bible' - was published in 2010. How to Grow Perennial Vegetables, also by Green Books, was published in 2012. Martin lives in Dartington with his wife and two children. Caroline originally studied art and design, specialising in glassmaking, and still works as an illustrator. She travelled for three years in Europe and Morocco in a bus powered by vegetable oil, then settled on a smallholding in Devon where she grew vegetables and tended livestock while also studying horticulture with the RHS. After taking part in Patrick Whitefield's Permaculture Design course in 2008, she was invited to return to work as the course cook. She has been cooking for Patrick's courses ever since, and now also works with him as a permaculture teacher. In the course of this work she is often asked about forest garden foods and how to prepare them. She realised the need for practical guidance on how integrate these new foods into familiar and appealing meals, which led to her collaboration with Martin Crawford on Food from Your Forest Garden. Caroline runs workshops and courses on permaculture, organic horticulture and traditional crafts.